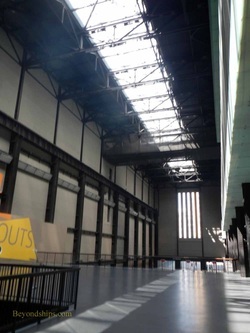 A short way beyond the theaters is the Tate Modern, the world's most visited collection of modern and contemporary art. 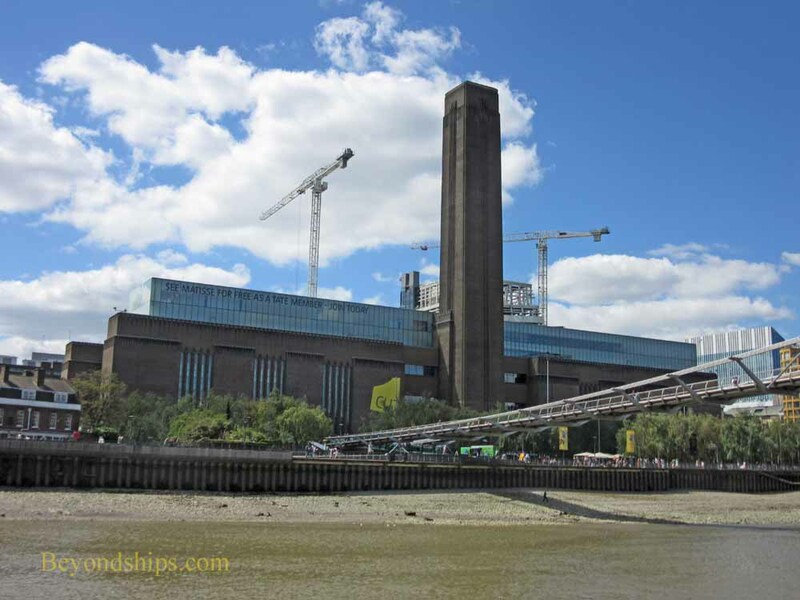 The museum is housed in the former Bankside Power Station, which closed in 1981. 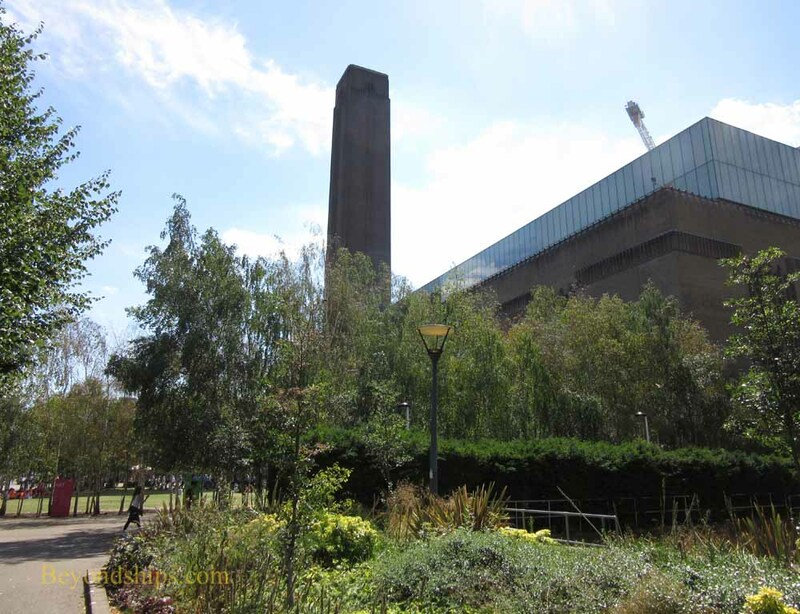 The grounds surrounding the old power station have been landscaped with trees and other plants while interior has been completely renovated to create a vast space for the Tate's collection. The collection is also quite vast. It focuses primarily on what is referred to as “Modern Art” - - essentially schools that flourished in the first three-quarters of the 20th century often involving abstraction. Just a few steps to the east, you come to Shakespeare's Globe Theatre. When American actor and director Sam Wanamaker came to London in the late 1940s, he was surprised to find that there was no theater devoted to Shakespeare. Therefore, he led an effort to re-create the theater where Shakespeare's plays were performed in London during Elizabethan times. Wanamaker did not live to see his vision fulfilled but in 1997, his efforts bore fruit when this recreation of the Globe Theatre opened. The building essentially consists of two parts. First, there is the theater itself. No one knows what the original Globe Theatre looked like. However, using evidence from archaeological excavations of other Elizabethan theaters and buildings, contemporary accounts as well as artists' panorama's of London, the design for the theater is an authentic recreation of the theaters Shakespeare would have known. In addition, the builders used authentic materials such as wooden pegs rather than nails, thatch for the roof and a 16th century recipe for plaster. Second, there is a modern exhibit area. 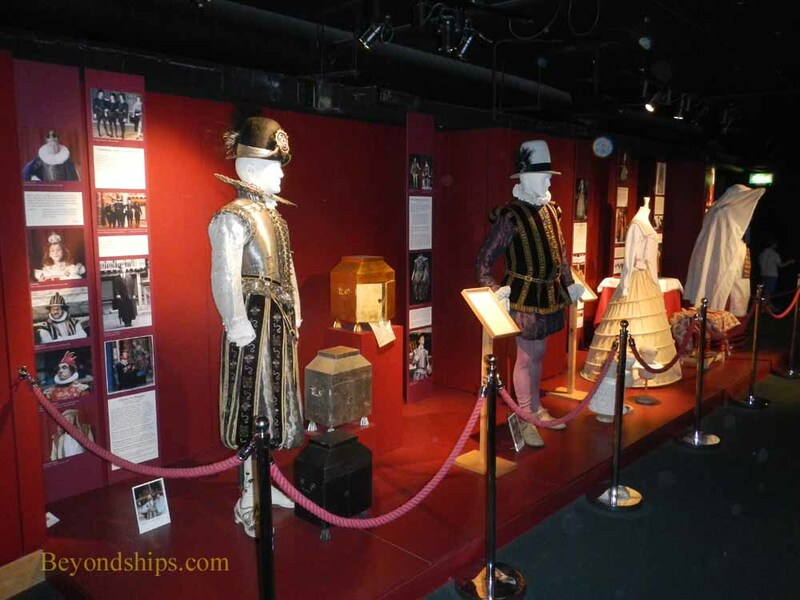 Here, you can learn the story of the Globe as well as see costumes used in productions that have been performed in the theater. Not only can you see a play performed at the Globe, you can visit the theater. The guided tours take you into the theater itself, which is significantly different than a modern theater. It is a circular theater with a large surprisingly ornate stage occupying one side. The center section where the best seats would be in a modern theater, has no seats. Instead, as in Shakespeare's day, the audience in that section of the theater has to stand throughout the performance. Above them, in order to provide natural light, the roof is open to the elements. Around the center section in a horse shoe shape are two tiers of benches. None of the seats is very far from the stage. Traveling further eastward, you come to another Elizabethan recreation, this time a ship. Sir Francis Drake was the foremost Elizabethan sailor. The unofficial leader of the English “Sea Dogs” he raided the Spanish treasure fleets in the Caribbean and cities in South America. Later, he led expeditions against Spain and played an instrumental part in the English defense against the Spanish Armada. The Golden Hinde was Drake's flagship in the first circumnavigation of the globe by an Englishman. During that expedition, the Golden Hinde visited California. To commemorate the 400th anniversary of that visit, two American businessmen commissioned the building of a recreation of the Golden Hinde. As with the Globe Theatre, this plan was handicapped by the fact that there were no records of what the Golden Hinde actually looked like. However, there was evidence as to the ship's size and there were some contemporary descriptions. Using such historical evidence as well as information about Tudor shipbuilding techniques, the Golden Hinde II was launched in 1973. 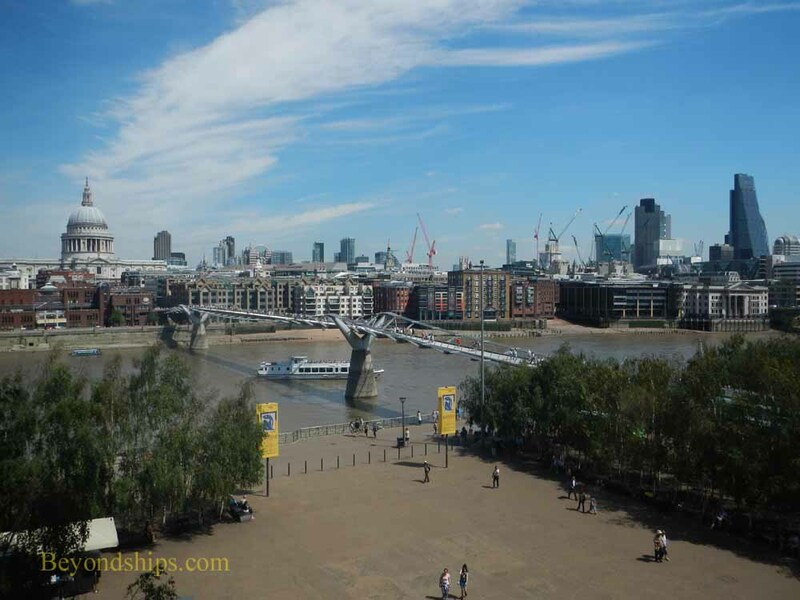 Today, the Golden Hinde II sits in her own berth surrounded on three sides by buildings. She is amazingly small, seemingly not much larger than the lifeboats on Allure of the Seas. It is amazing that people could have traveled so far in such a ship. The Golden Hinde II is open most days but general visiting hours are subject to various special events, which are listed on the Golden Hinde II website. 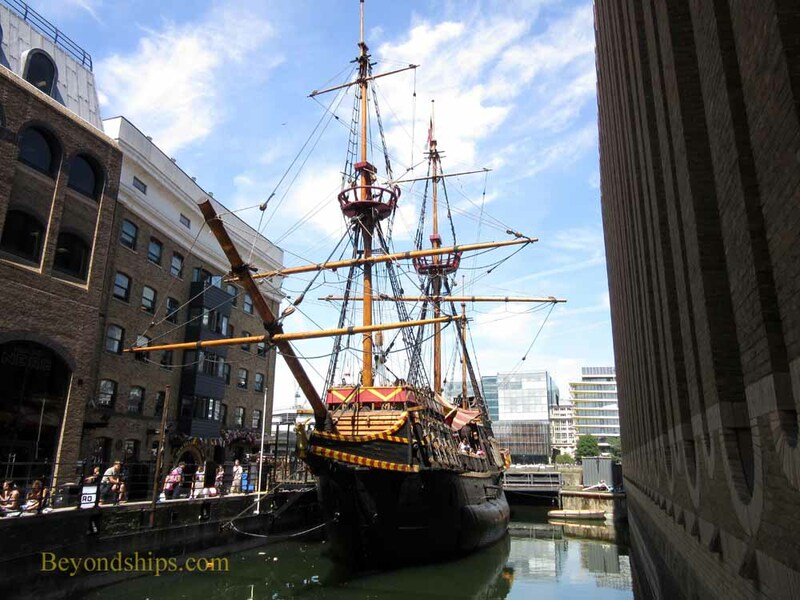 The fact that Drake was considered a pirate by his Spanish enemies appeals to children and considerable effort is made to make a visit to Golden Hinde II a family-friendly experience.